Mania Meneide was stabbed to death at this residence at 34 Meritt Ave. in Brockton, police said. BROCKTON — An 18-year-old man was arrested Wednesday for allegedly stabbing his mother to death in their Brockton home, the Plymouth district attorney’s office announced Wednesday night. Frantz Polynice is charged with one count of homicide and one count of assault and battery with a dangerous weapon in the death of his mother, 44-year-old Mania Meneide, according to a statement from Plymouth County District Attorney Timothy Cruz. “It was a mother-son relationship, and for it to end this way . . . We need to make sure we find out what happened,” he said. Officers found Meneide with multiple stab wounds in her home at 34 Merritt Meritt Ave. at about 1 p.m. on Wednesday. She was taken to Signature Healthcare Brockton Hospital, where she was pronounced dead, Cruz said. A heavy police presence remained at the single-family home throughout the night. A knife was found inside the home, authorities said. A heavy police presence remained at the single family home throughout the night. Yellow crime scene tape cordoned off the home decorated for Christmas. 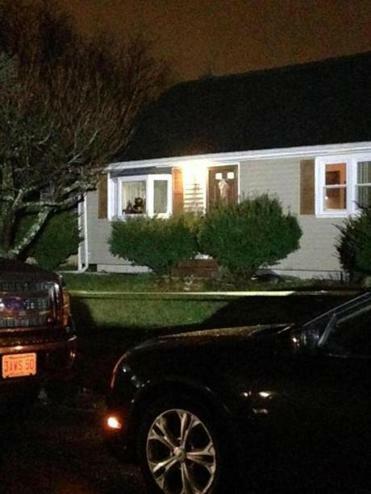 A knife was found inside the home, authorities said. Polynice is expected to be arraigned in Brockton District Court on Thursday. The apparent murder shocked neighbor Mark Powers, who lived next door to Meneide. Meneide had lived at the home for about five years with her own mother, and her son, Powers said. When he heard yelling from the home on Wednesday, Powers went outside. He saw emergency responders performing CPR on Meneide, as her mother stood on the front lawn. Polynice was in the back seat of a police cruiser, Powers said.